WOOT! How about I trade you a denon for a pioneer? BEST of both worlds! You might want to go buy some cases for your decks, keep them nice and safe. Cases are your cdj's best friend!! Make GC pricematch that crap too. it was like 85 bucks each instead of 200 bucks. yes, get the ones we have, road ready cases, cheap yet sturdy, and fits both denons and pioneers. trade or borrow, same difference. cool.. i'll get some when i have actual money again... guess that means the pios won't be moving around much for a while..
GT and Moo are the Quote Masters...hey I heard a mix from Granddaddy DJ on DI and was definatley enlighted into the world of goa/psy. I've heard some cool stuff before but never a whole mix! 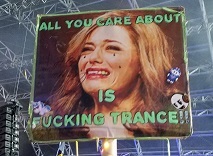 that's why I stuck to vocal trance since other mixes were about 2 good songs and the rest crap. So I'm about 3/4 of the way through this GTR 7 by MOO and I wish I could take it my car on the way home! Eeeeexcellent or EEEEX as I used to say when I was 10 (no extasy pun intended) I did buy some decent Altec's for my work computer so I can Jam when everyone is gone. SOOOO my question is if there is a difference between hard trance and goa/psy I'm guessing less 'psy' sounds? AND whatever happened to 'acid' house and trance, is that just melded into regular house and trance? Hey and when do any of you make it to Denver? If you played a show I'd be there fo sho bro!!! Me too Me too!! GOOOOO MOOOOOOO!!!!!!!! Moo, this was pretty awesome. Hadn't heard it yet and phew, was I surprised. Great work. omg...wants dl whenever u release it! MikeShaw may still have it on his FTP server, so that shouldn't be a GMail thing and no torrent availabe... kinda hard for me to even do one since me have no connection at home..
has anyone got an update link to this mp3?